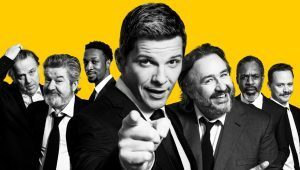 THE Olivier and Pulitzer prize-winning play, Glengarry Glen Ross, is kicking off its UK tour in Woking on Thursday 14 February at the New Victoria Theatre. After “sealing the deal” with critics and audiences alike during its West End run, the play’s first UK tour has a cast headed by two actors well-known for TV roles. Shelley “The Machine” Levene will be played by Mark Benton (Waterloo Road, As You Like It, Dirty Rotten Scoundrels, Hobson’s Choice). Olivier award-winning Nigel Harman (EastEnders, A Chorus of Disapproval, Shrek the Musical) will be the ruthless Ricky Roma. Set in an office of cut-throat Chicago salesmen, Glengarry Glen Ross tells the story of four desperate employees pitched in a high-stakes competition against each other. They’ll do anything, legal or otherwise, to sell the most real estate. As time and luck start to run out, the mantra is simple: close the deal and you’ve won a Cadillac; blow the lead and you’re finished. The performances at the New Victoria Theatre will run until Saturday 16 February.